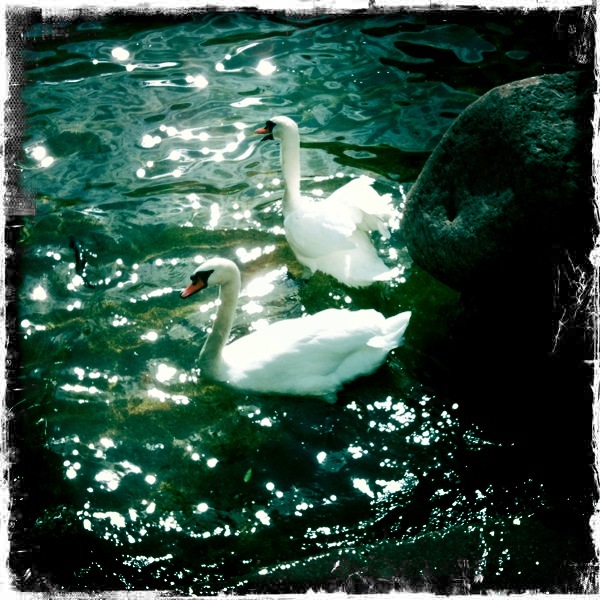 Graceful Surrender: Swan Medicine. September 2010. This weekend I attended a lovely one-day writer’s retreat in Portland, Oregon. The retreat itself was luscious, and made even more special by the presence of my dear friend Julie Jeske. Getting to Portland proved to be a bit of a challenge, and in the midst of it I noticed that I was completely surrendered to whatever the moment brought me. No angst, no worry, no anger or fear. My outgoing flight was canceled a scant nine hours before take-off. I ended up getting a flight at an airport 98 miles away, which necessitated a 3:40am wake-up so I could be on the road by 4:20. As I buckled into my aisle seat, I realized that my beloved iPhone sat in my car, in Parking Zone A/B, where it would not help me contact my pick-up upon arrival in Portland. The weekend went on in this way, and I found myself surprisingly unmoved by both “good” and “bad”. In fact, I didn’t even register any of it as “good” or “bad”. It was just what was happening, and it was all perfect. I wasn’t using my mind to convince myself of the perfection. I just knew it was perfect, and that I was okay. I moved through the day-long retreat in a state of centered, present equanimity. I could feel my heart’s truths as if they were being transmitted on radar signals, and I could speak them without hesitation or insecurity. They just were what they were. I learned some valuable lessons about showing up to the creative process – in this case, writing, but they really apply universally. In the morning, author Susan Piver led us through a meditation technique called shamatha, a Sanskrit word that means “peaceful abiding”. After twenty minutes we discussed what we had become aware of during the meditation; the truth that bubbled up through me was the difference between maintaining awareness of what is there in there in the moment, or sitting in expectation of trying to generate something. I can open myself to the creativity that is already there, and step into that flow, or I can try to produce something (read: something good enough). That is one sure way to a creative block. Throughout the day we used the free-writing process to access inner voices and wisdom. Free-writing works like this: using a prompt such as “what scares you most about writing”, let your hand move across the page for two or three or five minutes, and write down anything that comes to mind, even if you end up writing “Nothing is coming to mind. I can’t think of anything to say. Did I email Laura back? I have to do laundry tonight, and pay those bills. The days just keep getting away from me…” That free-flow will usually allow unconscious thoughts, feelings or beliefs to come up to the surface where they can be seen, used, dismantled or dismissed. One such free-writing prompt produced the following insights: “I expect as a writer to write it perfect the first time. I expect myself to devote my entire identity to being a writer, and to never want to do anything else. I expect to know what I haven’t learned yet about writing, and if I don’t know I shouldn’t even try.” Valuable expectations to become conscious of, because those little buggers need to be drawn and quartered. Again and again I surrendered to the exercises, to the fear, to the insights, to the inspiration, to everything that showed up. I continued to flow through the weekend and yesterday, on a cloud of surrender. It was magical. This afternoon I fully realized how surrendered I had been, because I walked into yoga class and promptly ceased to be that. Five minutes in, I started to lose my cool. My body was tired and sore, and poses that are usually rejuvenating were exhausting. The first 45 minutes of class looked something like this: I gnashed my teeth, I spoke harshly to myself, silently bitched at the teacher for holding the poses so long, pushed myself through the vinyasa without gentleness, checked out so that I couldn’t allow my body to talk to me. By the time class was over, I could hear my heart’s truths again. I was surrendered into that which is. Even into the impermanence of my surrender. What is your experience with surrender? How do you get/keep yourself there? Do you know how it feels in your body, in your heart? By the way, I didn’t check in about my checklist. I think there’s something to that…more later. I love this post. I’m totally going to create my own free-writing questions and flow with that. I felt instantly teared up when I read all that you expect. LOVE the photo… one of your best to date! It’s an ongoing challenge to me to stay available and in a surrendered state… and at my age, oy! But I didn’t come to this way of thinking until much later in life so I forgive myself for that… having a deep forgiveness is very much a part of the surrender process, I think. You are so insightful Maggie, keep working it!